You'll be £5.20 closer to your next £10.00 credit when you purchase Aunt Branwell and the Brontë Legacy. What's this? Elizabeth Branwell was born in Penzance in 1770, a member of a large and influential Cornish family of merchants and property owners. In 1821 her life changed forever when her sister Maria fell dangerously ill. Leaving her comfortable life behind, Elizabeth made the long journey north to a remote moorland village in Yorkshire to nurse her sister. After the death of Maria, Elizabeth assumed the role of second mother to her nephew and five nieces. She would never see Cornwall again, but instead dedicated her life to her new family: the Brontës of Haworth, to whom she was known as Aunt Branwell. In this first ever biography of Elizabeth Branwell, we see at last the huge impact she had on Charlotte, Emily and Anne Brontë, as well as on her nephew Branwell Brontë who spiralled out of control away from her calming influence. It was a legacy in Aunt Branwell's will that led directly to the Brontë books we love today, but her influence on their lives and characters was equally important. As opposed to the stern aunt portrayed by Mrs. Gaskell in her biography of Charlotte Brontë, we find a kind hearted woman who sacrificed everything for the children she came to love. This revealing book also looks at the Branwell family, and how their misfortunes mirrored that of the Brontës, and we find out what happened to the Brontë cousin who emigrated to America, and in doing so uncover the closest living relatives to the Brontë sisters today. This books seems to be a good place to start if you’re interested in learning something about the home life of the Brontes. This, was an eye-opening biography that changed my mind about Elizabeth and made me question Gaskell’s biography. I recommend this for fans of the Brontes and Romantic writers. This is a book I have been waiting for, for what seems like ages. I have read many books about the Bronte family and their friends but there has been little material about Mrs Bronte's own family. But this book puts all that right in spades. I have enjoyed Nick Holland's other biographies very much and this is every bit as good. The style is engaging and enthusiastic, and there is so much lovely factual detail, from so long ago. It helps, I suppose, that the Branwells were an important family in Penzance because they left more material behind than might have been the case back then. Very lucky for us. What I especially like is the way this book made me engage with the people in the book, and see something of their characters - especially Aunt Branwell herself. Only one criticism - like all good books, I didn't want it to end! As an endorsement, I have bought copies for other people. I liked this book. I wasn't sure if I would, because of the obscure subject matter, but I really did - The perspective was very light, the facts seemed reliable, and the story (life?) engrossing. This would be an enjoyable read for any Bronte or history fan! Fascinating. I feel that I learnt a lot about a figure who I knew next to nothing about before. So well researched, and nicely pieced together. 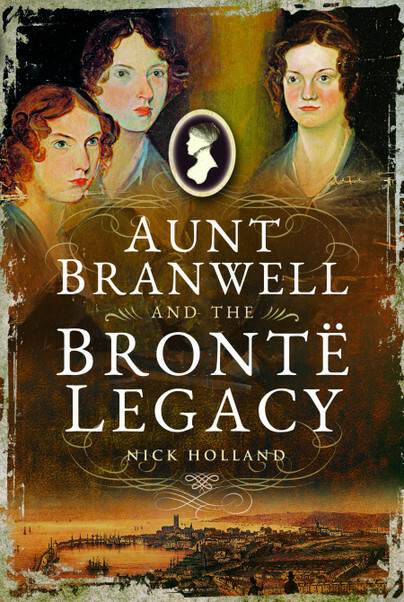 Nick Holland offers a very constructive and helpful introduction to the life and achievements of Elizabeth Branwell, ‘Aunt Branwell’ to the four Bronte children who survived into adulthood. He is already a biographer of Anne Bronte and Emily Bronte, and this book examines the background and role of the woman who helped nurture and educate after her sister’s death. After she died Branwell Bronte confessed just how much he had depended on her care and nurture but it is the three Bronte girls who revealed the educational and inspirational effect that this woman had on their literary lives. Elizabeth Branwell was a Cornish woman, culturally immersed in the life of the community of Penzance. The Branwells were reasonably prosperous, were active Methodists and fully involved in the activities of Penzance and the surrounding Mount’s Bay. We learn, for example, that she was a member of the late 18th Century Penzance Ladies Book Club, a very progressive feature of local life. She was steeped in her knowledge of local folklore and tradition, and Nick Holland argues that this experience and awareness is later reflected in the writing of Anne, Emily and Charlotte Bronte. Her awareness of the open countryside around Penzance was in a very different setting and yet it was a transferable awareness that enabled her to inspire the three young women’s awareness of their landscape and customs when she came to care for them after their mother’s death in 1821. She had only ever left Cornwall once before to stay with her sister and emerging family in Yorkshire in 1815-16 but in 1821 she accepted her Anglican brother-in-law’s call for help and wet to Yorkshire, never to return to Cornwall ever again. She immersed herself in the education of her three nieces and she encouraged their early literary output, and indeed it was her legacy that enabled them to publish what became their internationally respected novels as young women. Holland does deal with the persistent suggestion that Elizabeth Branwell was aloof and difficult by explaining that much of this reputation came from Elizabeth Gaskell who had interviewed a member of the Bronte household’s staff who was sacked in 1821 when her services were not required after Elizabeth Branwell had arrived in response to Patrick Bronte’s call for help. He regards this as an unfortunate distortion of the reputation and contribution of this woman who, in fact, fulfilled a major role in developing the literary talents of her nieces. This is a very interesting book. The book is very interesting whether you are a Bronte fan or not. It easily pulls the reader into 1820's England, giving you the real feel of this time and age. I loved that the author chose to write this biography on the woman who raised the famous Bronte children after the death of their mother. Much has been written about the family, but little about the woman who raised them. This was an interesting read and offered unique information about this family! Nick Holland's name caught my eye on NetGalley as I previously read and enjoyed his book about Guy Faulkes, so I requested this book. I have read a few Bronte novels and knew a little bit about their lives, but not much. Just like with Guy Faulkes, here Nick Holland didn't disappoint. You can tell he has done extensive research and is passionate about his subject. There is a wealth of information, delivered in an easy and pleasant to read, vivd writing style, yet it's not so much as to become a bore. I learned a huge amount about Elizabeth Branwell and her nieces and nephew, as well as about life at the time period and about Penzance. What I particularly liked is that Nick Holland, despite writing a biography, managed to make all these people come to life. I would have liked to see a few illustrations in the book, hence my four-star rating, but otherwise, it is pretty much perfect in terms of a readable, enjoyable biography! I give Aunt Branwell and the Brontë Legacy five out of five stars! This is the third book about the Bronte family that I have read this year and it was by far the most enjoyable. Breathing new life into the well-trodden area of biographies about this amazing family, the author has done a wonderful job in bringing Elizabeth Branwell to life from the scant information available. The book is well-researched and the author has an engaging writing style which draws the reader in. I did like this book and I would recommend it if you want to gain more insight into this famous literary family. It’s worth noting that Elizabeth Branwell left no letters or diaries behind, so Nick Holland does an excellent job of pulling other sources together to create a portrait of her. This isn’t just a good biography of Elizabeth Branwell. It also serves a concise introduction to the Brontë family history as well. This is the first book I have read by this author – so I had no pre judgements or expectations. I found this to be an exceptionally easy read which was both well researched and presented. The love of the subject by the author came across beautifully – I can imagine if you were new to the story of the Bronte sisters this enthusiasm would also inspire you to further reading and research. This is the fifth biography I have read this year, which focuses on my beloved Brontes and the first to explore the infamous sisters through the character of their Aunt. Holland has found a subject amply suited to his approach, combining scholarly insight with storytelling. I am a big fan of this authors work and was thrilled to get an ARC. As a massive Bronte fan who has read extensively I’m always on the look out for new books on the subject and this doesn’t disappoint. I loved this book. ‘Aunt’ Branwell has always seemed to me a much overlooked figure, but here we get to learn more about her early life and the sacrifices she made for her family. A truly admirable woman of courage and kindness. This work does her complicated life justice and she leaps from the page. Charlotte, Anne and Emily were undoubtedly genius’ but it is doubtful there words would ever have been seen without the influence, love and money of their aunt. I highly recommend it. I do not know too much about the Bronte sisters of Branwell but this does seem to be a good book about them. It gives some interesting information about the interaction between Branwell and the Bronte family. So if you like to know more/a different angle about them this book does give you that. Whether you are already a Bronte devotee or like myself someone with only a rudimentary knowledge I think you will find this an informative and most importantly an enjoyable read. There is also a collection of photographs that lend credence to the text. The author relies on original period correspondence and writes in a very entertaining style, which makes the book accessible to any reader. A very interesting read! Nick Holland was born in Barnsley, South Yorkshire in 1971. He is a best selling fiction writer, who has now become a successful non-fiction author. His recent biography of Anne Brontë was critically acclaimed, with the Mail On Sunday calling it 'an excellent book full of passion and pathos'. Nick has long been fascinated by the story of his fellow Yorkshire Catholic Guy Fawkes, and this new biography allows him to reveal the man behind the myth.